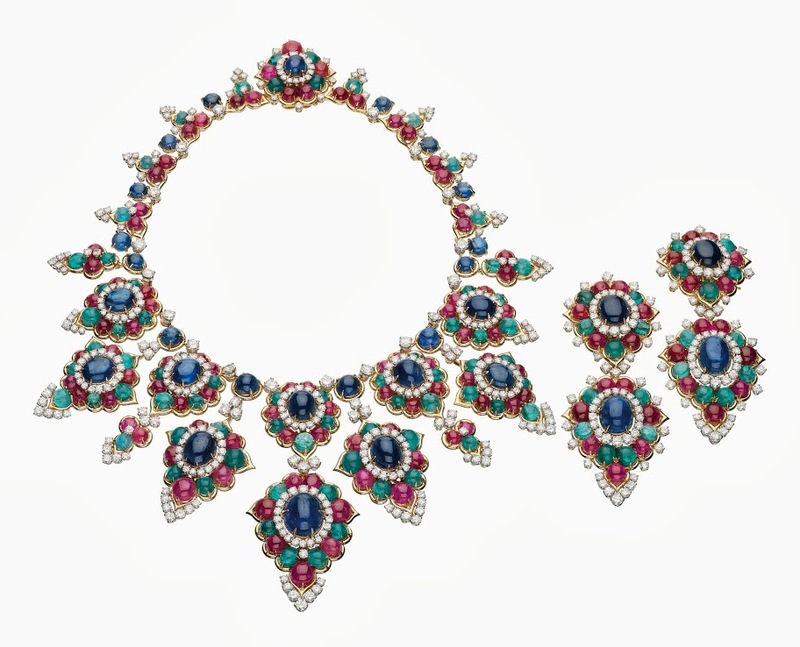 the style saloniste: Bravo Bulgari! 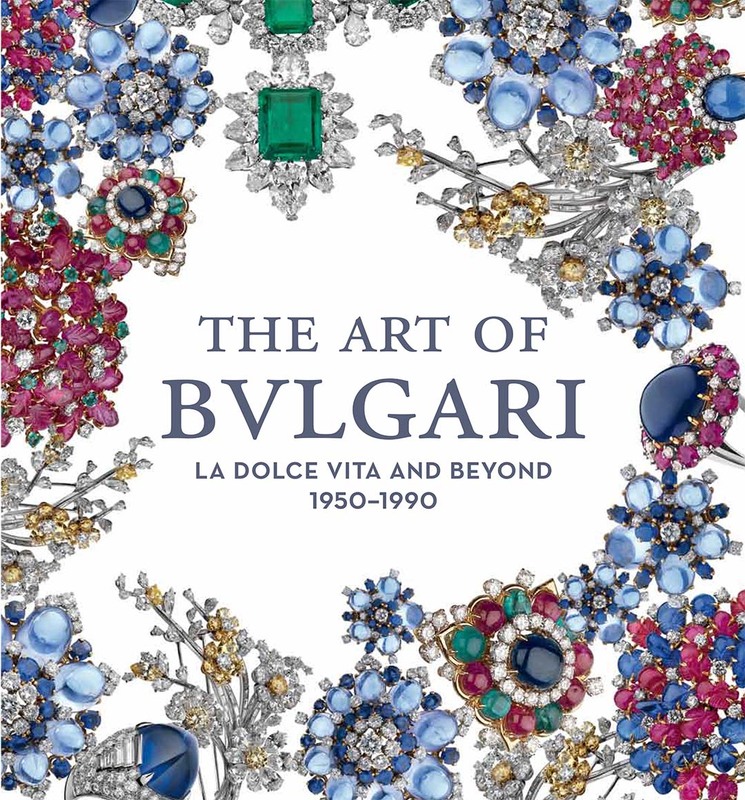 This week at the de Young Museum in San Francisco, The Fine Arts Museums of San Francisco opens The Art of Bulgari: La Dolce Vita & Beyond 1950 – 1990, an exclusive exhibition of approximately 150 pieces created by the renowned Italian jeweler over four decades. Works in the exhibition also include those from the 1970s and 80s, a particularly innovative period for the jeweler and one influenced by Pop Art and other contemporary trends. 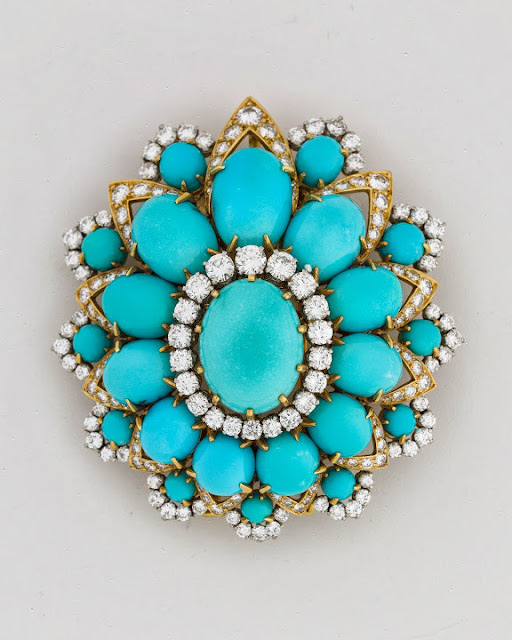 “In the 1980s the Parentesi collection had a smoother, modular, almost architectural presence; both show how the jeweler could lead in new directions with a strong sense of design,” said Martin Chapman, curator in charge of European Decorative Arts and Sculpture at the Fine Arts Museums of San Francisco. 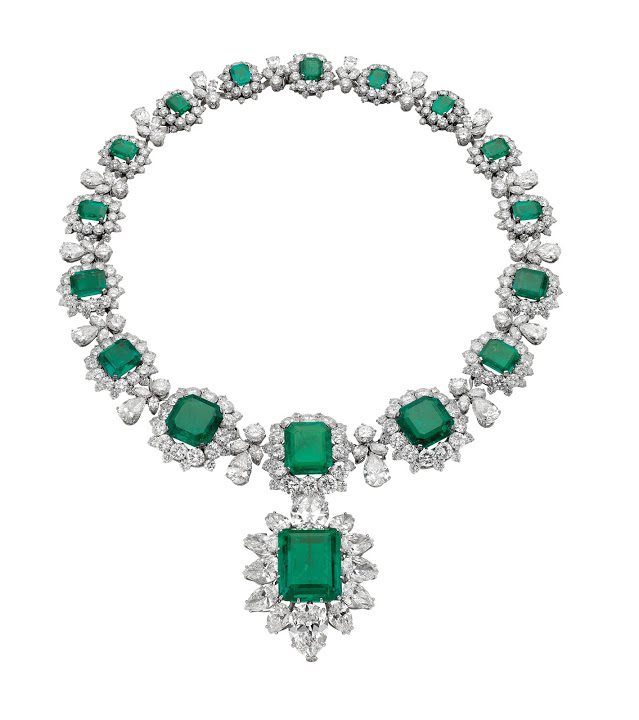 Bulgari’s notably ‘dressed’ with jewels and adorned such prominent patrons and movie stars as Sophia Loren, Ingrid Bergman, and most notably, Elizabeth Taylor, who has long been a key aspect of the jeweler’s reputation. 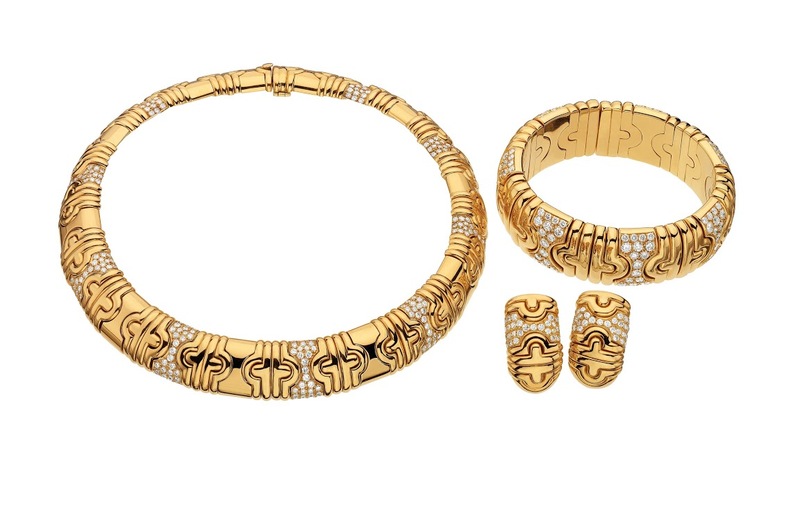 Bulgari recently acquired many extraordinary styles from Taylor’s collection, now part of the Bulgari heritage collection. “The BULGARI store on via dei Condotti (the official name) began to draw more visitors from the States during the 1960s, when many film stars were in Rome making films at Cinecittà—the principal Italian movie studio. 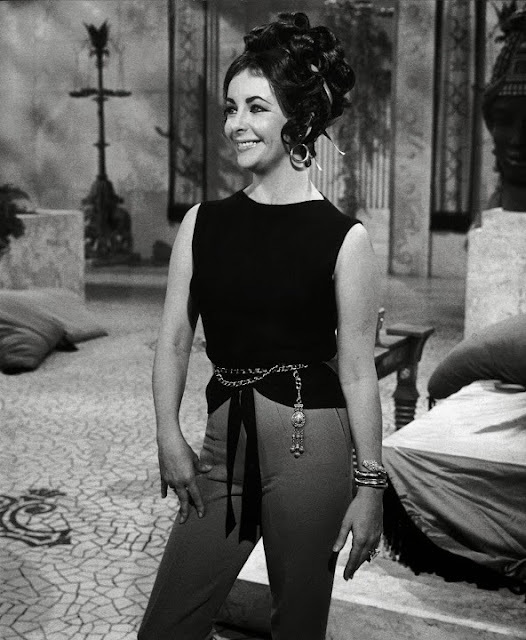 Elizabeth Taylor was a great fan of the jewelry house, frequenting it on breaks from filming Cleopatra in 1961–1962 and continuing her patronage long after the production finished. 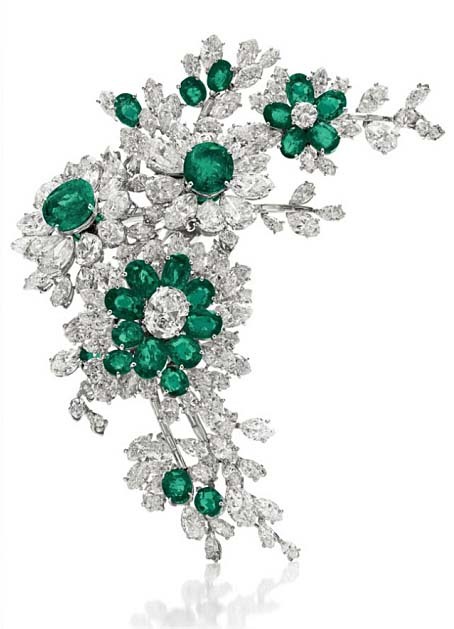 Such was her fervor for the jeweler that her husband Richard Burton said, “The only word that Elizabeth knows in Italian is Bulgari.” For their engagement he gave her a substantial emerald brooch from Bulgari and followed it up on their wedding day in 1964 with an enormous matching necklace.” – Martin Chapman, curator of the show, in the exhibit catalog. 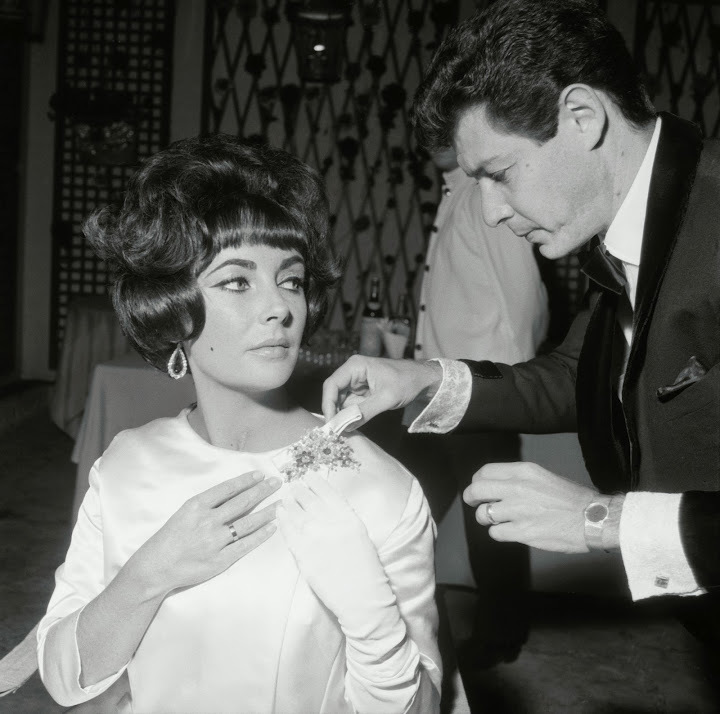 Eddie Fisher adjusting Elizabeth Taylor's Bulgari tremblant brooch, Rome, 1961. Photo: © Bettmann/CORBIS. The brooch was probably given to Elizabeth Taylor by Eddie Fischer, her husband at the time and was worn both as a brooch and hair ornament. On the “tremblant”pieces, flowerheads are mounted on spring settings, which allow them to flicker at every movement, thus marvelously radiating their light. 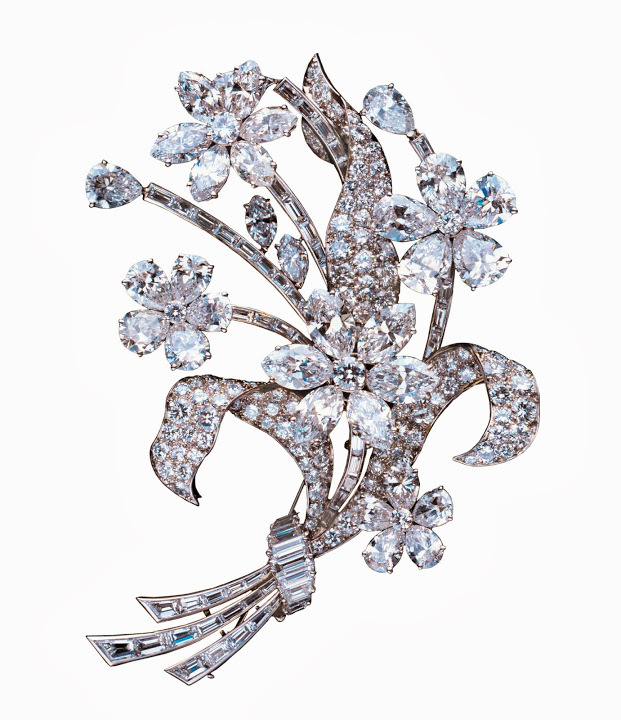 Since the 18th century, realistic floral motifs had been a constant theme in French jewellery. 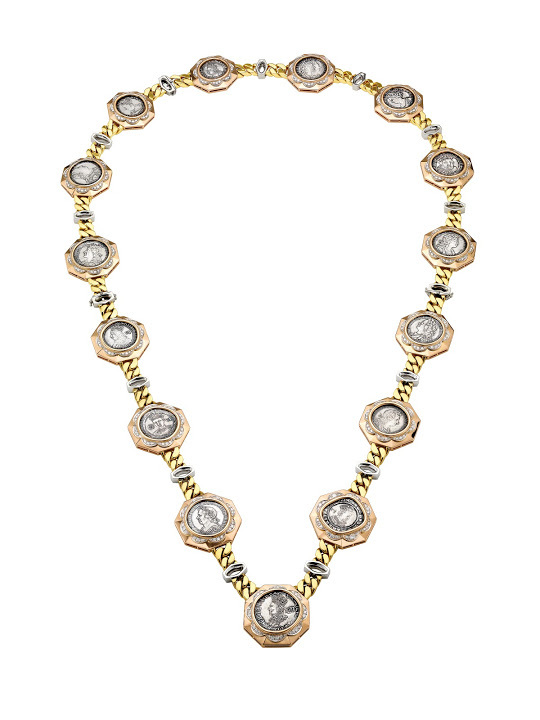 In the early 1960s, Bulgari rivalled the finest Parisian jewellers in creating these asymmetrical sprays. 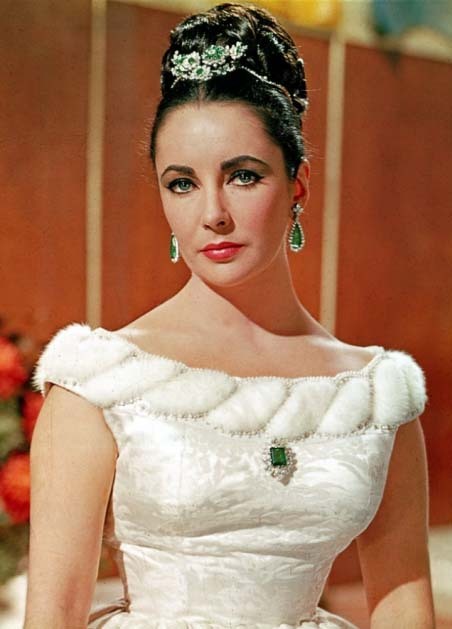 Elizabeth Taylor became rather obsessed (or at least extremely and deliriously and permanently delighted) with Bulgari when she was in Rome to make ‘Cleopatra’. The subsequent moments of her love affair with Richard Burton were marked with Bulgari sapphire, emeralds and diamonds. 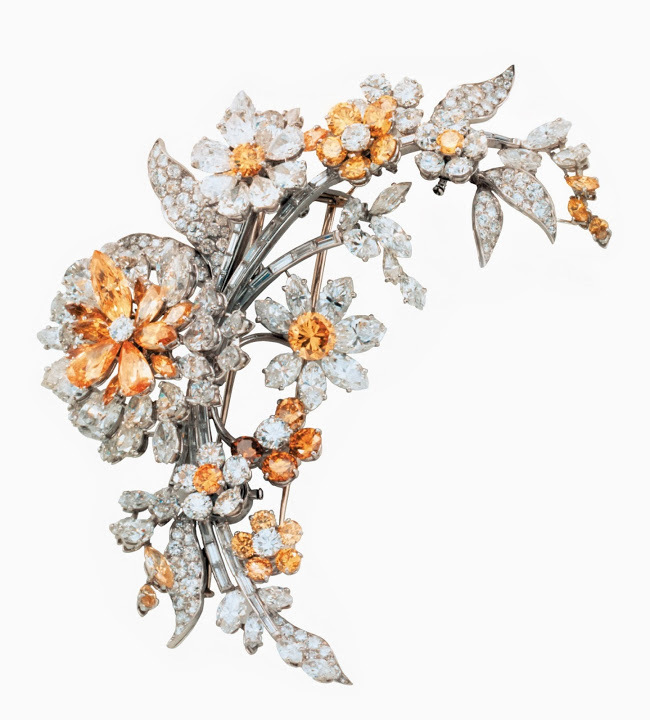 I encountered many of these dramatic pieces at Bulgari’s display at the Biennale des Antiquaires at the Grand Palais in Paris last fall, and most of them are in the exhibit at the de Young. One of Taylor’s sapphires was 50 carats. There were stones of extreme voluptuousness and rarity. 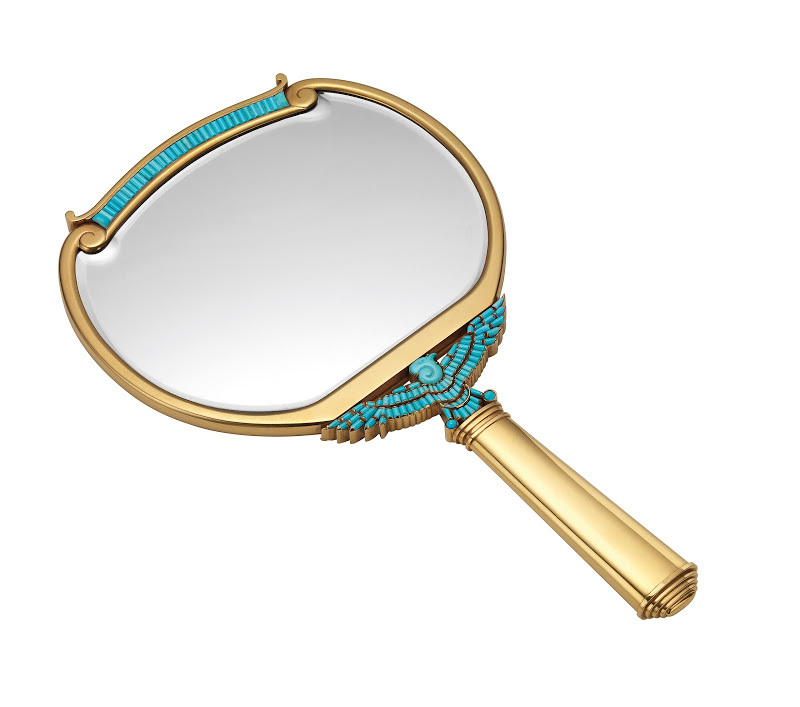 Now this is jewellry. I discovered Bulgari on my first visit to Rome, as a student. I was studying art and classical architecture—and my goal was to see every Caravaggio painting in Rome, all eight (one questionable), as well as every baroque church, and the collections at the Doria Pamphilj palazzo. One very warm hazy golden afternoon, with an hour free, I ventured alone down swoony via Condotti. My eye was suddenly captured by the most mesmerizing colorful jewels in the window of Bulgari. I stepped closer. The colors seemed...planetary or solar and too intense for this world. These were substantial pieces—think Sophia Loren—with large cabochon sapphires, tourmalines, citrines, spinels, aquamarines and turquoise stones. 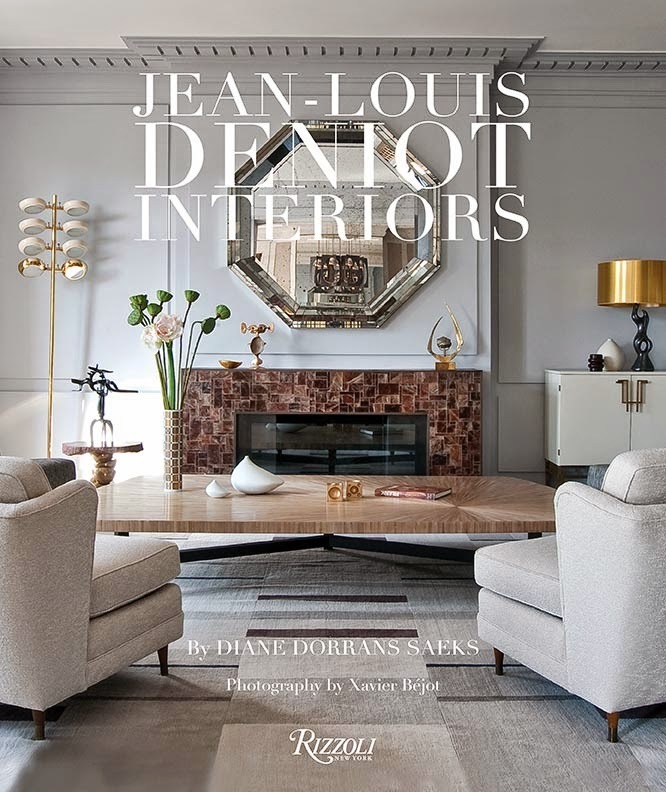 The modern, colorful, exuberant and superbly crafted designs made every faceted jewel in other windows seem fussy and dated. In the intense summer heat, I was neatly dressed (nice white linen blouse, black skirt, Capri-style sandals, a neat little black cross-body) so I rang the door buzzer and was discreetly ushered inside. I’d studied Latin for years, so I improvised Italian, and I asked if I might possibly look, per favore, if they would be so kind, si prega di... at some of the jewels on display. 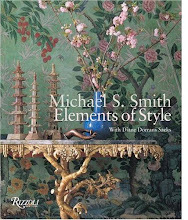 I was offered a leather-cushioned Klismos-style chair, a glass of chilled water on a little square silver tray with a hemstitched linen napkin, even an espresso. Clearly, as a romantic student I was there to ‘view’. They were charming. I was made extremely welcome, rings were brought out, and I was introduced to the elegant, hospitable, and private world of Bulgari. It was joyful, serious, very Roman and very classic Italian bella figura. I left, thirty minutes later, and stepped into the intense, sun-struck afternoon. I’m so excited that Bulgari, now a great international name, has come to San Francisco, and everyone can discover the rare beauty and consistent point of view. I hope you’ll see the show. In the meantime, the big opening party is on September 18, and Nicola Bulgari, the grandson of the founder of modern Bulgari (the company, however, is now officially 125 years old) will pay us a visit. I will spend moments in reverie. Memories of the via Condotti and a charming Bulgari welcome. Denise Hale has a noted collection of fine jewelry, including museum-worthy Bulgari pieces. She wears all of her favorites as a ‘second skin’ and never goes out (or dresses) without her famous Bulgari gold and diamond necklaces and bracelets, her David Webb diamond pin, or perhaps a Taffin sea anemone pin, sapphire earrings, a Boucheron chameleon diamond pin, as well as a spectacular and glittering diamond and white gold choker she acquired in Buenos Aires recently. But the piece I admire the most is a multi-dimensional Bulgari diamond bracelet she was given in Rome on her 19th birthday, by the international businessman who had become her first husband. 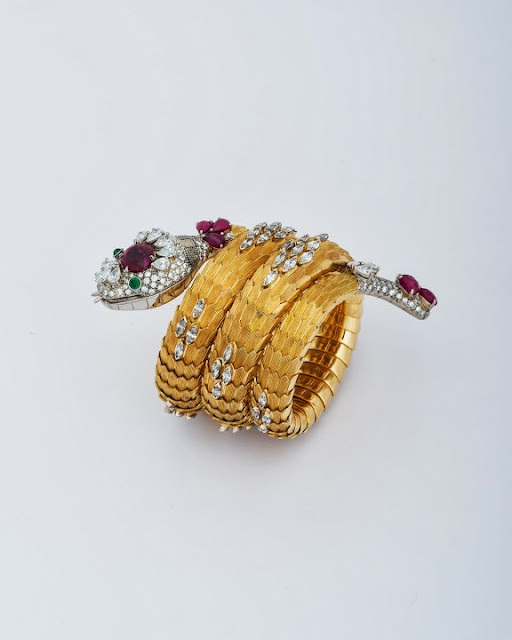 The bracelet, which Hale has lent to the Bulgari exhibit, generally whiles away the hours in a special locked box in a very secret bank vault with her other precious pieces. Occasionally she will wear it to a very special occasion—a private dinner, a birthday, a gathering among dear friends in San Francisco. 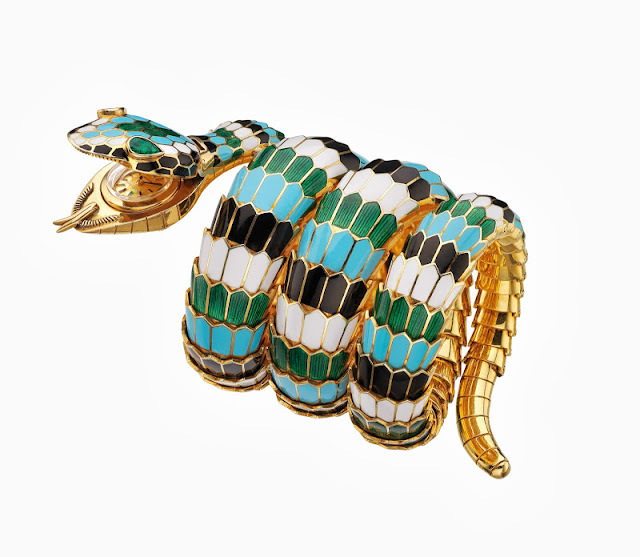 This is a most remarkable creation, admired even by the likes of Nicola Bulgari, whose grandfather, founder of modern Bulgari in Rome, presided over its design. 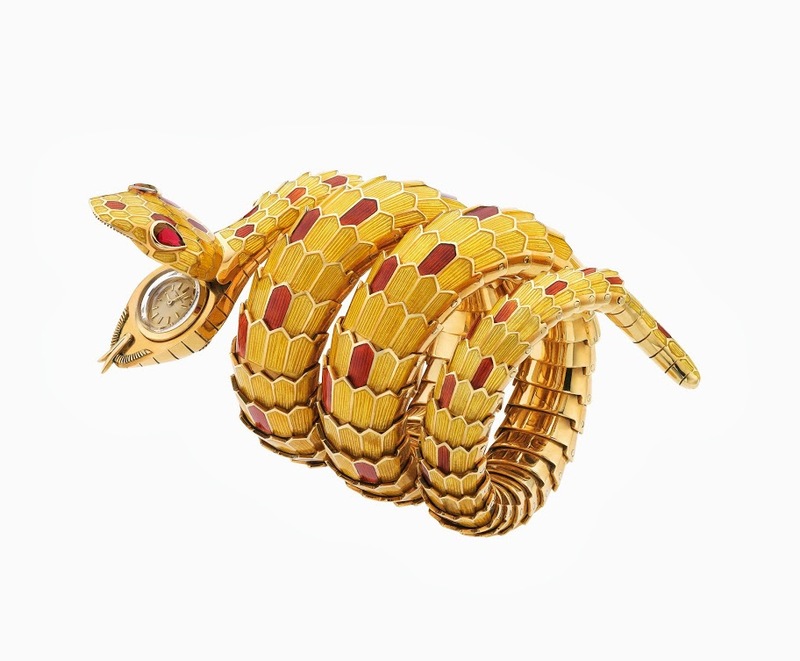 When occasionally Mr. Bulgari visits San Francisco, he takes time with this bracelet, gazing at it appreciatively and almost, it seems, reconnecting with his grandfather’s art and exquisite aesthetic. 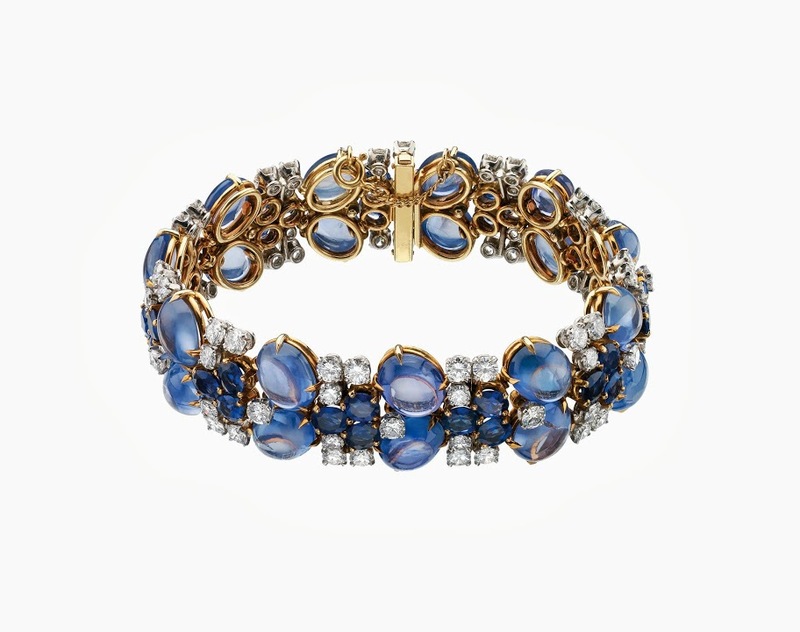 Arriving or departing a soirée, the bracelet is concealed beneath a long silk or cashmere sleeve. 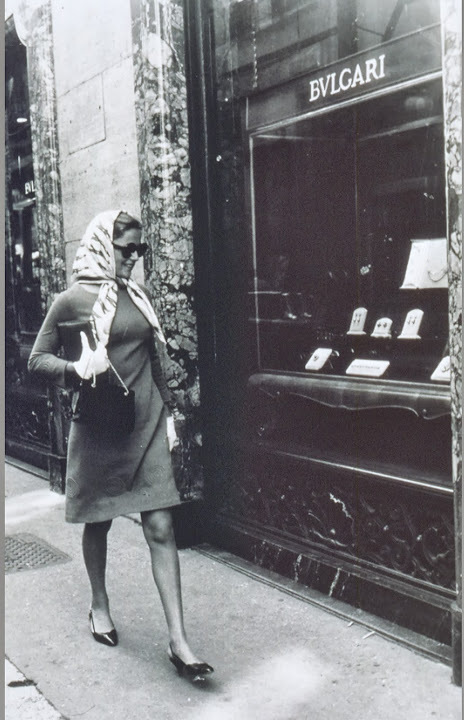 Denise (see more about the remarkable Hale in THE STYLE SALONISTE archive) recalls the afternoon when her husband took her to Bulgari on via Condotti to select her birthday gift. Bulgari fans who look closely with find two other pieces from Hale’s collection, including sapphire earrings made by Bulgari using Hale’s grandmother’s sapphires, which are of exceptionally deep and rich hue. 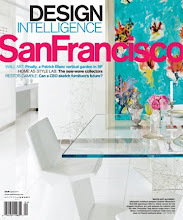 The de Young is housed in a copper-clad landmark building designed by Swiss architects Herzog and de Meuron. 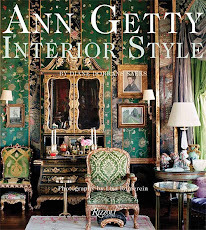 It showcases the institution’s collections of American painting, sculpture, and decorative arts from the 17th to the 21st centuries; art from Oceania, Africa, and the Americas; a diverse collection of costumes and textiles; and international contemporary art. 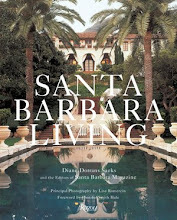 All photography courtesy Bulgari and the Fine Arts Museums of San Francisco, used with express permission. so gorgeous...men should wear more jewelry. I'm jealous! What a "sparkling" post, Diane. 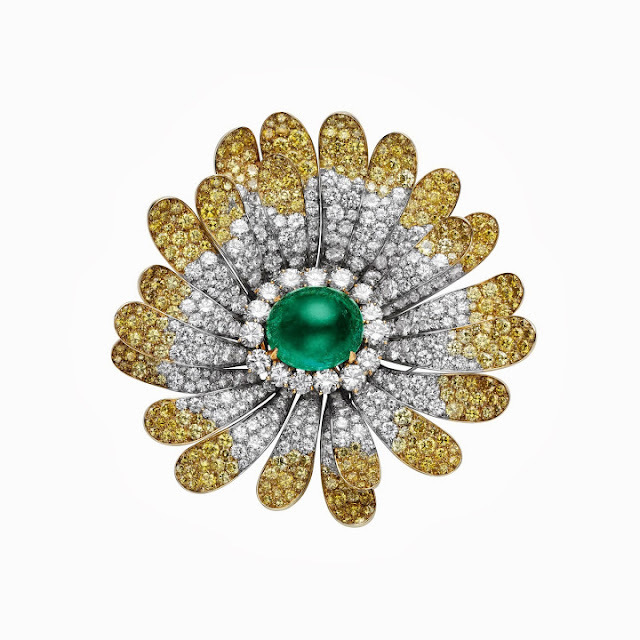 I especially loved the story of your own visit to Bulgari tucked into this preview. 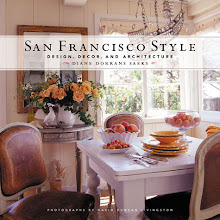 Looking forward to seeing the DeYoung show. You have my permission to wear every piece of Bulgari. You have my permission to wear earrings. You have my permission...encouragement...to wear perfume (as some of my friends do) that is...sweet and pretty. Please...if you love it wear it...and if it makes you happy, do it. I hope I see you at the de Young. I'm attending the opening party on Wednesday. 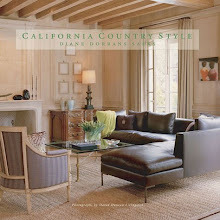 Hi Diane, what a collection of beautiful pieces in your post and what a lovely story of your visit to the store in Rome. How charming and how gracious of them to treat you so wonderfully, and perhaps you could have been a buyer - who would know?! I always want to do the same in the Place Vendome but never do...as I am sure I look too much like a tourist even with my black and scarves....haha. That snake watch is something else.. I'll be seeing the show on Wednesday at the opening celebration/party, and all the Bulgari heads will be there, including Mr Nicola Bulgari, who is in my story. Yes...well...I was a student in Rome and I had the impression of graciousness and charm and hospitality from Bulgari, and when I thanked them, and slowly departed, it was with great appreciation of a lovely gesture on their part. Perhaps they thought my father would come in later to buy that ring I loved...or that my fiancé to be would drop in...but I think they saw themselves as ambassadors (more, in my case, than salespersons). What a divine post Diane. I thought perhaps the exhibit was coming to the Grand Palais in Paris but it's Cartier in November. Quelle dommage. I love the snake bracelet which is saying a lot because normally snakes freak me out completely!! but I also never get sick of the parentesi motif. Diane so much beautiful jewelry and art here. I would love to see the exhibit! 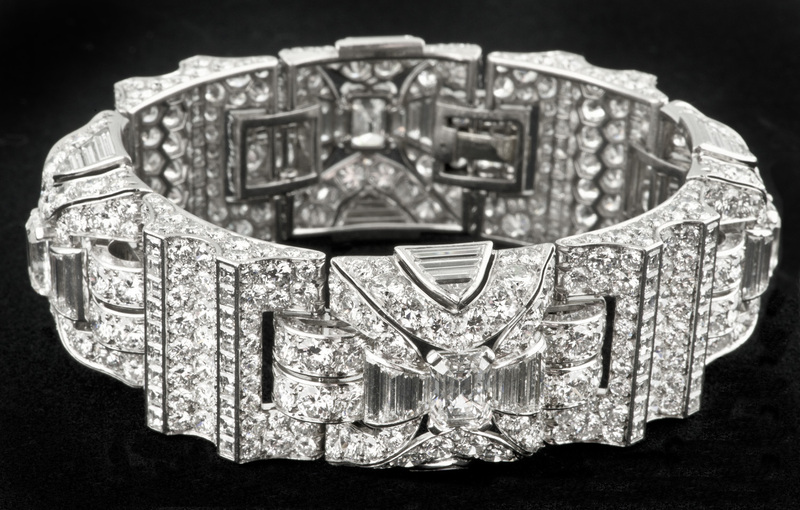 Denise Hale's bracelet is so exceptional; takes my breath away! I am looking forward to the exhibit, and your post captures the glamour, excitement and supreme artistry of Bulgari, past and present. 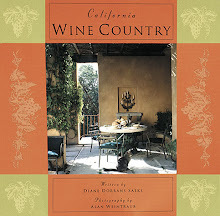 I especially enjoyed your reminiscence of your first visit to the shop on Via Condotti. I can picture and even feel the atmosphere you describe. 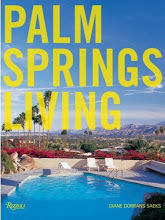 The quality of that experience is one that I was fortunate to observe closely and share, in a different way and place. I think that in that there is the underlying excellence in all things, all aspects, and the passion for what they do and a quiet pride in what they offer. That afternoon you relate says everything about Bulgari, to me. Loved your post. 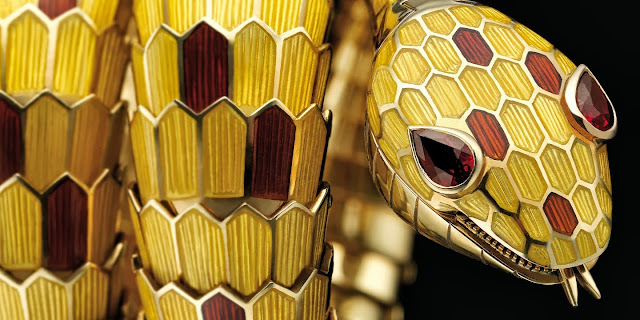 I love Bulgari...especially now that I've taken such a close look at all their archive images. I'm attending the opening night patrons' party tomorrow night...can't wait to see everyone wearing Bulgari...all the vaults and coffers will be emptied. but these are so chic. You would love. The really interesting aspect is that most of these bracelets were custom made and very one-of-a-kind. Fabulous. 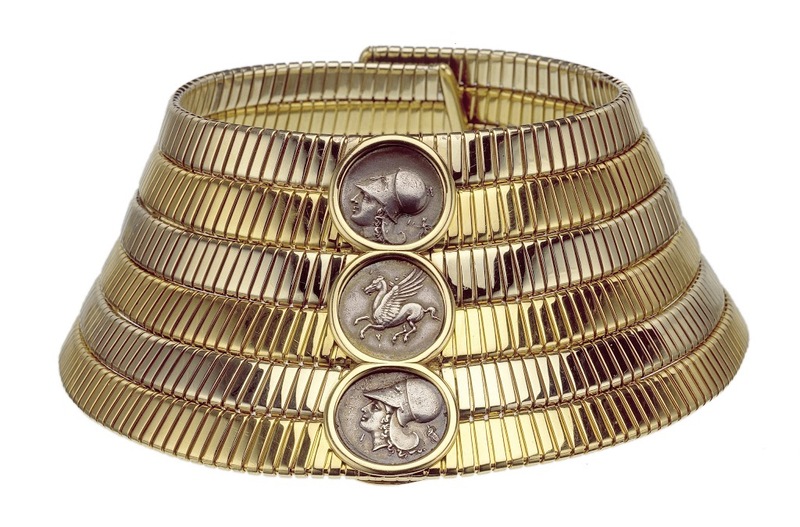 Oh, and Diana Vreeland wore her snake belt around her neck...and she had the bracelets...lucky. YES...it is thought that most likely Denise's could not be made today. It's an Art Deco inspiration--and in the days that she acquired it...the gift...in the fifties...the Bulgari workshop was above the boutique. Everything was made there. 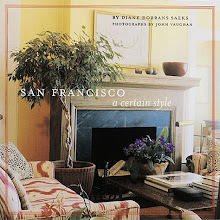 I present these jewels and architecture and design and interiors and opera and music and art features...because I believe all of these forms of creativity...inform each other. 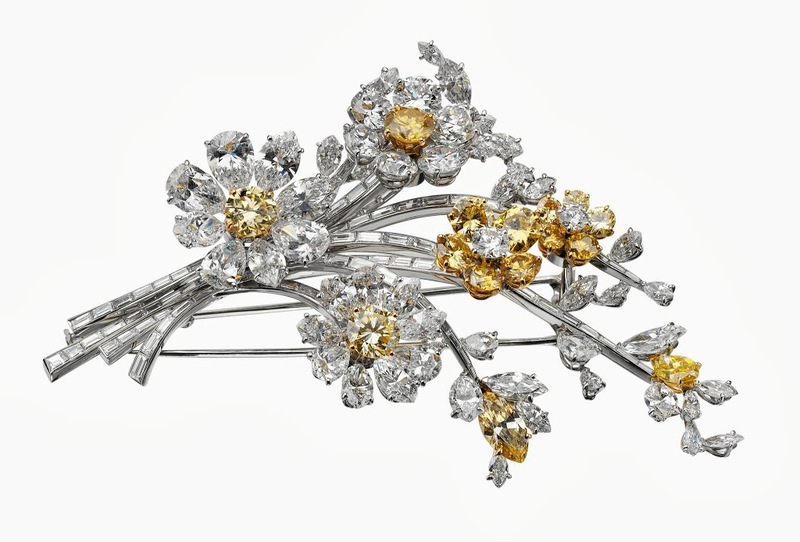 I always feel that designers can be inspired by jewels...and architects can get ideas from opera...and musicians can get ideas from paintings. Photography can inspire music...and travel is always the great inspiration with all senses on alert. I had not thought of my first Bulgari experience for some time (I've been to Rome many times since...always look at specific quests...) . It was when I saw the black and white photo of Virna Lisi walking outside Bulgari's shop on via Condotti...and saw the logo and marble facade...that I remembered, vividly...the warm afternoon I was walking...saw the jewels and the store...and was propelled to press the door buzzer...magically it opened, and handsome man with a beautifully fitted suit (of course) invited me in...and now I'm writing about it. 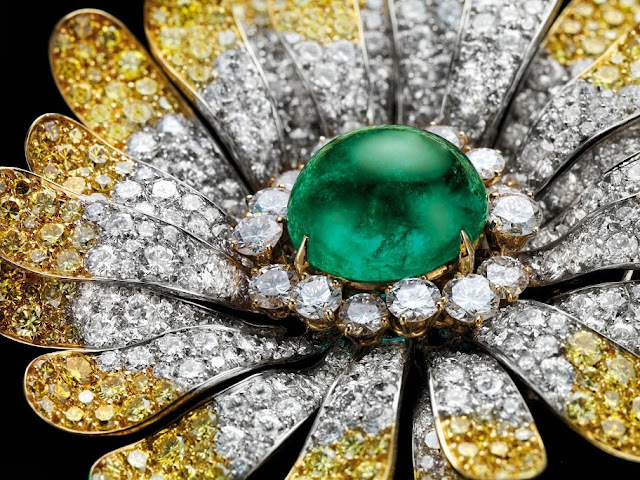 I was so impressed, looking through all the images in the archives...at the great craftsmanship and artistry and design of Bulgari. 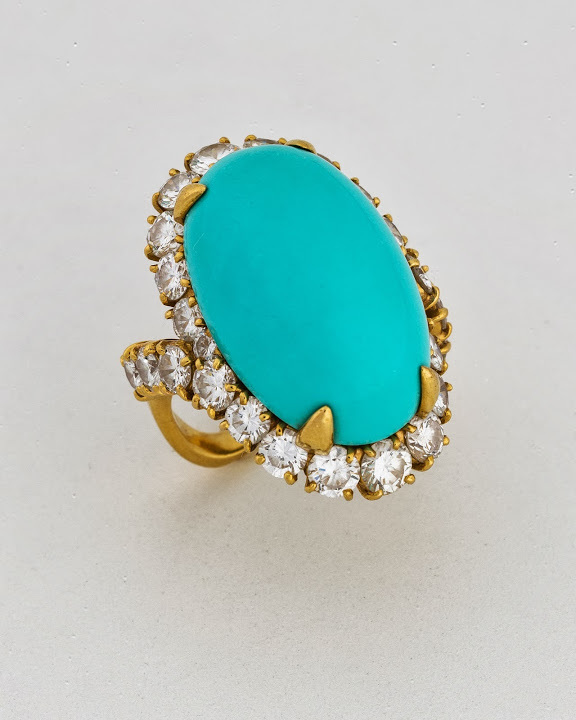 I've always love Bulgari...and I am fortunate to have some rings...that I love. I had not thought of my happy visit...first...to Bulgari for some time...but when I saw Virna Lisa...it was a total sense memory. 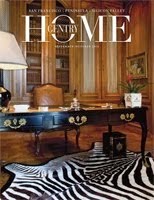 Seeing the collections of friends of mine...very exciting. I can't wait to see all the Bulgari jewels...worn tomorrow night. 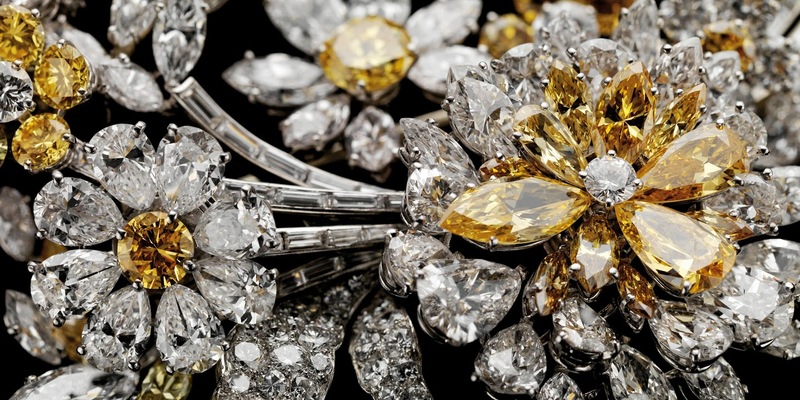 Nicola Bulgari is an especially distinguished man...he is the grandson of Giorgio...who was really the founder of Bulvari as we know it today...before, they made a lot of silver and were less focused...now, since the fifties...it is full-on glamor. how nice.. i love your blog very dearly.. 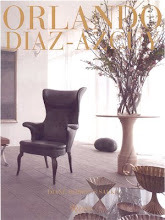 So glad I read your post before seeing the exhibit, it got me so excited to see these exquisite pieces. 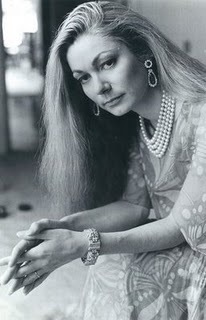 I gasped when I saw Denise Hale's bracelet, I wouldn't have known it was hers if you didn't write about it. It made for great conversation at the gala! 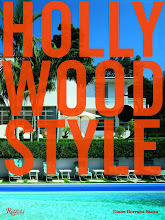 I'm obsessed with the deco design and the history behind it. 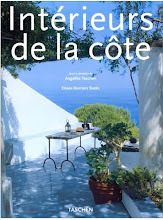 Thank you for your chic and fascinating posts! 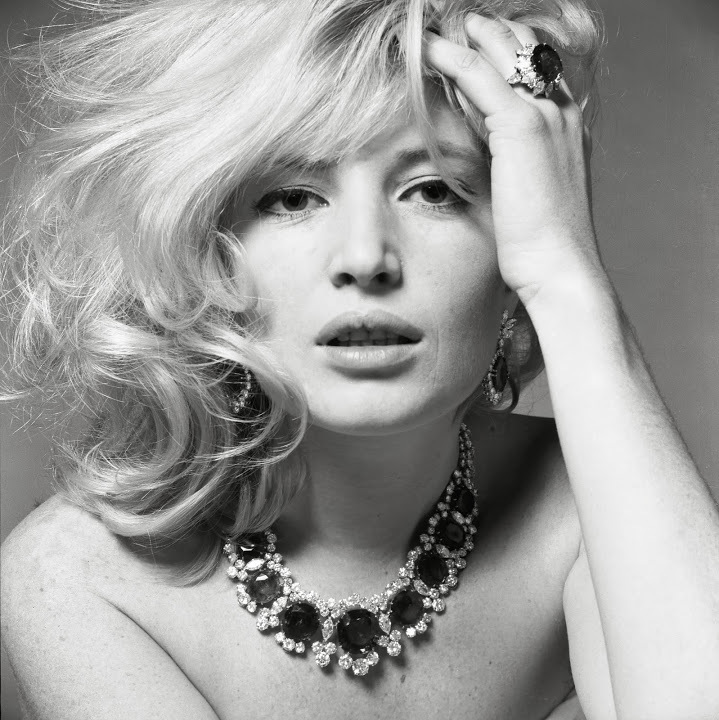 I am confused about the identification of the photo of Monica Vitti wearing what is described as the "Seven Wonders" necklace (both here on your blog and at the exhibit). Except the necklace she is wearing has 9 emeralds, which look to be closer in size to the center stone, rather than graduated as in the "Seven Wonders". 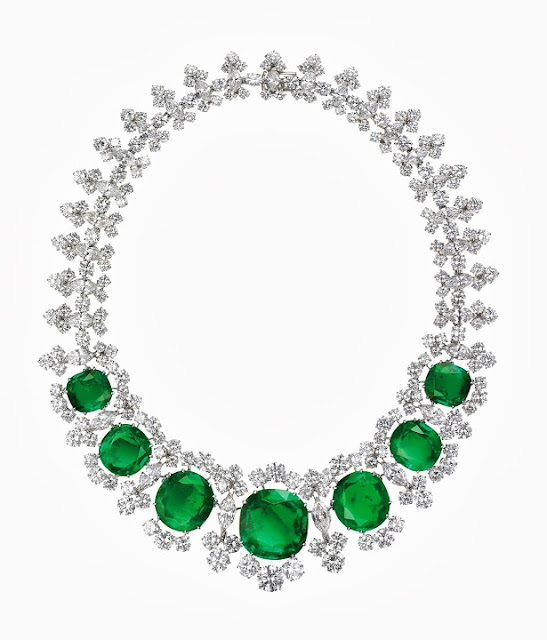 Even the sketch of the necklace in the exhibit shows 9 stones. Was the necklace revised at some point?